Will the final film in the original series sign it off in style or secure its fate in average franchise purgatory? Some years after the ape revolt, humans and apes are almost living in harmony, if not for some trigger-happy gorillas. The apes must make sure they stick to their first law: ‘ape must not kill ape,’ but face difficulty when a mutiny arises. Looking beyond the three main goodies, Caesar, MacDonald and Virgil, there’s not many other characters that avoid becoming unconvincing, dull, and amateurishly performed. Sure we have an okay, if not slightly predictable, villain amongst the group, but most of the characters fail to make much of an impression, which is a problem particularly when most of the film is made up by the actions and reactions of two groups of characters. There’s also a group of (very) slightly mutated humans who’s only initial motivation to attack the apes is bizarrely boredom. Such a weak motivation for an antagonist group to set a story rolling makes any film slightly doomed from the off. Despite this, the main problem is the main story’s unnecessary feature length existence; it comes across as far too short and nothing happens of importance in the overall franchise story arch. When compared to some of the other films, all this serves to do is tie up loose ends in the franchise, but the same result could have been achieved by a thirty to sixty minute finale at the end of the previous film. 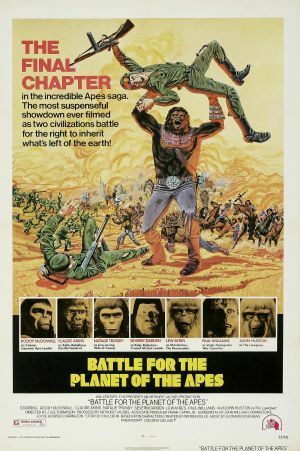 Battle for the Planet of the Apes is a limp finale to a five film series which shot itself in the foot by becoming a feature length in the first place. With largely dull characters and only a handful to help it move past the opening credits, I'd only recommend watching directly after the first four, so it has some relevance.